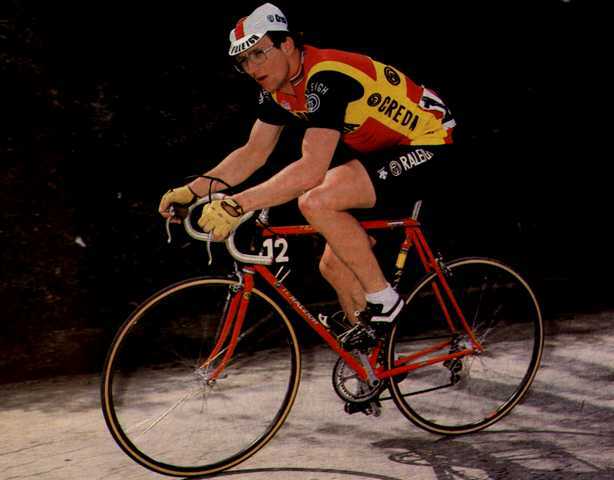 A member of the all-powerful TI Raleigh team that dominated the pro racing scene during the late '70s and early '80s, Jan Raas was a prolific winner able to stand out in a team full of winners. His first major classic win came in 1977 in Milan - San Remo, a report on which you can find below. It was in his native Holland's only classic the Amstel Gold Race that Raas really shone, only a determined effort from Bernard Hinault in 1981 stopped Raas from achieveing an incredible six wins in a row. In 1977 a young Raas escaped on the Poggio to register a famous win in Milan - San Remo. In 1978 Jan Raas won the Amstel Gold Race after some hi-jinks among the following cars. In 1979 Raas was again at the centre of controversy as he took the World Championship. In 1982 Raas won a thrilling - and dusty - Paris-Roubaix. After searching the web for some time, I reached the conclusion that this is the first site to deal with Raas the rider in any depth. I found some quotes from him as team manager but nothing of any substance on his riding career. If you know anywhere, please LET US KNOW!